I’ve really grown to love my stove with the smooth glass stovetop. I know not everybody is a fan and many people prefer gas ranges, but I really like having a smooth surface for cleaning up after cooking spills because let’s face it, spills happen. When it’s time to clean my stovetop, I often use my homemade soft scrub cleaner, but many times I use this simple and quick frugal method too. And even though I’ve done this several times, I’m always pleasantly surprised at how clean my stovetop looks when I’m done with very little effort on my part. All it takes is a quick sprinkling of baking soda, a dish towel that’s been moistened with soapy water, and a little bit of soaking. While things are sitting and soaking I usually get the rest of my kitchen cleaned up. Then I go back to the stovetop, scrub things around a bit, give it a final rinsing, and it looks great! It doesn’t get much cheaper than a bit of baking soda and soapy water, two things most of us have around the house already. If you’ve been spending lots of money on those little bottles of smooth stovetop cleaner, give this homemade method a try. I think you’ll be as pleasantly surprised at your results as I was! 1. Fill your kitchen sink with warm soapy water. 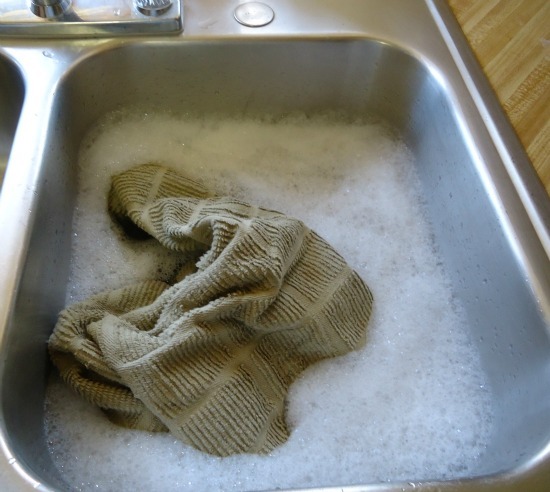 Put your dish towel in the soapy water and get it thoroughly wet. 2. Sprinkle some baking soda on your stovetop. 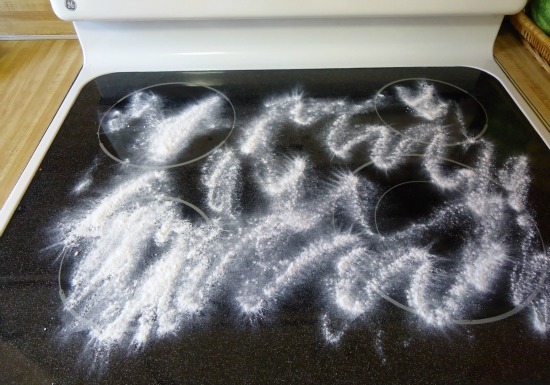 If there is a particularly dirty area, make sure there is a good amount of baking soda in that area. 3. Take your dish towel out of the soapy water and wring it out a little bit (the towel should be thoroughly wet with the soapy water, but not dripping wet). Lay the wet towel on your stovetop over the baking soda. 4. Let everything sit for about 15 minutes. 5. Once things have soaked for about 15 minutes, use the towel to wipe and clean the stovetop. After a little bit of wiping and cleaning, you may want to rinse the towel with some fresh water to help rinse away the baking soda. And that’s it! 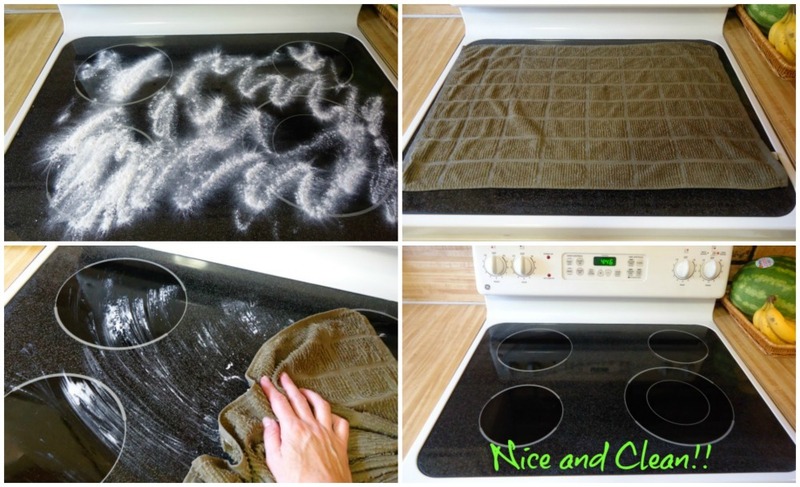 A very simple, cheap, and effective way to make your own smooth stovetop cleaner. And even though this method requires a bit of soaking time, it’s still pretty fast and easy as there’s no measuring or mixing of ingredients needed AND you can be cleaning other things in the meantime. My jelly cooked over on to my glass top stove and is now hard as a rock. I have tried to scrape it off and used baking soda paste but it is rock solid. Any suggestions? Really needing to do pepper relish tonight!! I wet a rough dishcloth in one corner and put a pinch of baking soda on that and make a moist paste. I rub any soiled spots until they disappear. I rinse with a damp cloth or paper towel. I use a dry cloth to buff and shine. I try to clean after each use. That way my stove top is not hard to keep clean. I used baking soda on my brand new top which is black and it scratched the surface. Don’t try this! I’m sorry you had that result. I’ve used this method many times and have never had any scratches. I wish there were a pic showing how dirty it was to begin with. Trying to examine between the sprinkles of the soda; it looks too clean. Sorry I didn’t think to get a “dirty” picture before cleaning. 🙂 I’m not a person who lets my stove get super dirty between cleanings, but I do cook at home almost every night and so there is always a certain amount of spots and gunk around the burners that needs attention whenever I do clean, and this baking soda approach has worked very well for that. I’ve been using Bar Keeper’s Friend for about 10 years and have never had a problem with scratching. You can scrub as much as you need. Everything comes off and leaves a shiny surface. I also use a paint scraper on heavy burnt on food….no problem be gentle. I put a small box of Baking Soda in each of my refrigerators and Deep Freezers every couple of months to protect against odors. Then I use the old soda when I change it with vinegar to put down my bathroom and kitchen drains/garbage disposal – it bubbles up and cleans real well. So I get the Baking Soda (generic brands) for 54-75 cents or so. I like to use my ‘used’ baking soda like this too! What if you have a gas stovetop? I have built up grease that I can’t get off. Any suggestions? How about gas stoves, looking for ideas to clean it well. This method might work on the gas stove burners too. Perhaps you could try removing the burners, and then shake baking soda on them, cover with soapy towel, and then scrub. Not sure if it would work the same as with a smooth stovetop, but might be worth trying. The half vinegar half blue Dawn spray works on the gunk build up on stoves. 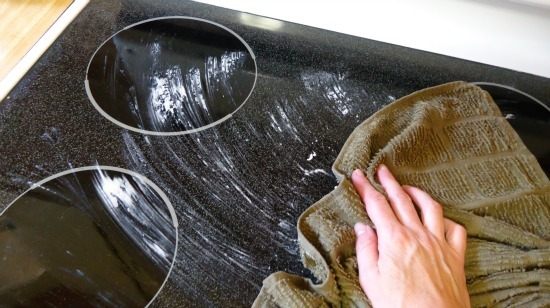 Leave it set for awhile, wipe with paper towels then clean with warm water cleaning rags. Is this safe on an aluminum stove top? Been doing that 3-4 times a year for 5yrs… and the top still looks like brand new. Cost: $24.00/qt and I’ve used maybe 1/10th of the first bottle.. and maybe $2 bucks worth of sandpaper (each time I’ve only used 1/4 of 1 sheet… comes 10 sheets to a pack. Ivan this might be cheaper in the long-run but IMHO sure seems like a lot more elbow grease required. I tried this and it works wonders. It is the greatest way to clean my smooth top stove. It is less abrasive than the stuff I was told to use. I was also told by the place I bought my stove to use a razor like you clean paint off of windows just be careful and use the right angle. This is used to clean something that is hard cooked on. These newer models of glass top stoves don’t scratch very easily. In fact, I’ve never seen anything that will scratch them. After all, you drag your steel pots across them and they don’t scratch. The best cleaner I’ve found is Barkeepers Friend. It WILL NOT scratch. http://www.barkeepersfriend.com/ Read it for yourself. Make a paste with water and BKF and scrub away. The worst deposits come right up. Rinse with a damp dish towel and it gleams like a mirror. Does anyone know how to get melted plastic off a smooth top w/o causing even more damage?? I done the same thing and accidentally melted a plastic plate to mine. To clean it easily without scratching glass I turned the stove top on and reheated the plastic that was on the stove top once it was all melted I turned it off and used a big wad of paper towel that was slightly damp to quickly clean all the melted plastic off, have a bag ready to place paper towel in as it can be a little messy, cover any bench top near where your working as it could be harder to get off your benches then the stove itself. place a paper bag over the plastic area and take your iron and heat it up and iron over the the paper bag which will melt the plastic onto the paper bag for an easy clean up.Repeat until all the plastic is gone using different paper bags as needed. Baking soda has never scratched anything of mine, have no idea where the one commenter got that. It’s just abrasive enough to clean, but not to scratch. 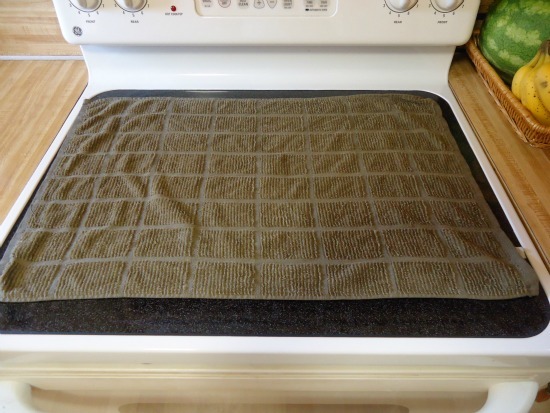 Also, the majic cloths, miracle cloths, whatever the brand name is, are wonderful for drying your stove top after cleaning and leave no smearing. Also, if no time for the baking soda and wet tea towel, Bar Keeper’s Friend is a great cleaning agent that doesn’t scratch. It’s usually found in the cleaning dept. of stores along with detergents, Comet, etc. It’s been around a longgg time. I have done something similar by using DAWN Pump foam soap which I applied all over the top, then covered with a wet dish rag, and after 15 minutes, the crust vanished instantly. Need to try the baking soda to compare the two methods. Thank you very much. I’ve personally used the soaked towel method before and it works great. But as an added note, the commercial glass top stove cleaners are much more abrasive than baking soda and so are straight edge blades, both were given to me with both of my new glass top stoves and neither have caused any damage other then a beautiful shiny clean surface. I only went the baking soda method to save money. Both are equally save for the stove top. It really works. baking soda, warm soapy towel and 15 minutes. We always have spills some were set and it almost like new. I had been using Mr. Clean erasers and it is a lot of elbow grease but works. Thank you so much for the suggestion. I will be buying baking soda when on sale to keep it on hand. I use mixture of vinegar and water and wipe the stove down and it works great my flat stove top looks awesome and I use the vinegar and water in a spray bottle on almost everything when I get out of the shower I spray it down and wipe with a clean dry rag and the faucets and wipe my shower curtain down its best thing ever. An additional comment…..Once my stovetop is clean, I spray it with rubbing alcohol and polish it. I do this with all of my SS appliances and they sparkle. I use comet cleanser and a nylon shoer scrubby and not a scratch after two years. Baking soda and peroxide works great. Sprinkle on the baking soda add peroxide and make a paste, leave it sit for about 10 minutes lightly scrub them wipe away the mess. I don’t know about using the greased lightning on my stovetop controls. I used it on my husbands truck to get the bugs off and when I wiped it, the paint was all over my cloth. I’m afraid it would take all the writing off your control panel. I’ve always used this method, but I spritz the stove top with water first, then sprinkle baking soda over that. I wait about 30 minutes and then wipe thoroughly with a sponge. When I feel that it’s clean, then I rinse the sponge and continue this until all the soda is gone and I wipe it finally with clean water and a dry towel. If a film is left behind, I use Windex and paper towel. 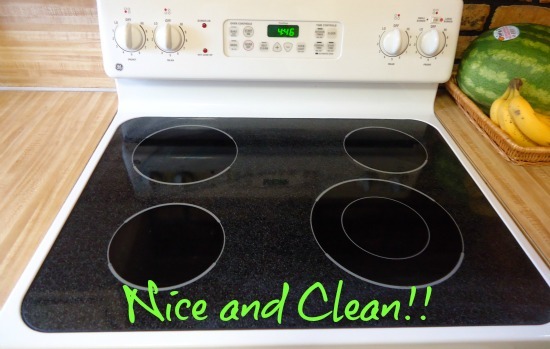 It really does leave your stove top looking brand new! and ..NO SCRATCHES! Can you tell me how to clean the set-in grease spots off the BACK of a stove (we have a traditional electric) — the plastic part that has the clock and temp dials on it. Its black and I am afraid of scratching it (I did that once with a scrubbie on my old white stove). Thank you! Honestly i tried the baking soda thing on the back and it worked there too! No scratches or even scrubbing!! Loved it! Thanks! I clean my smooth top stove with Greased Lightning. I spray it down good, then I let it soak in for a few minutes. Then I use a razor scraper around the eyes. After that I spray window cleaner on it. It looks brand new. Greased Lightning and Windex is the only cleaners I use in my house. Greased Lightning ROCKS.. Yes, Greased Lightning! That product made my short list of 3 store bought cleaners I can’t give up (https://www.themakeyourownzone.com/2013/05/3-store-bought-cleaners-i-cant-give-up.html) I usually use it on my floors though, and I hadn’t considered trying it on my stove. Emily, I have had success with a product called Goo-Gone! Works great on grease build up. Try coconut oil…it’s amazing stuff for so many things. Ive never heard of cleaning with coconut oil….i will have to (find it) and try it lol 🙂 thanks! i use a generic Orange cleaner. It works great on over the range micro, vent hood, and cabinets! I use a towel immersed in hot vinegar and partially wrung out. Sprinkle baking soda on cook top and lay cloth on top. It will foam up. Let it sit for about 10 min. Now this I have to try! I can very much understand wanting to be cautious when you have a nice new stove. However I have not seen any scratching on my stove using this method. Me too!! I do it all the time. I don’t like that cleaner that came with my smooth top stove, I don’t like chemicals in my kitchen. I make my own cleaners . Neither have I, great method.